LAWRENCE — As many as 400 students from around northeast Kansas are expected to participate later this month in the annual High School Design competition sponsored by the University of Kansas School of Engineering and the Self Engineering Leadership Fellows Program. The event will feature competition in six different categories, giving students a taste of real-world engineering applications and providing the university with a chance to recruit top talent from around the region. “We're hoping to have a really successful day,” said Carter Joy, a junior in mechanical engineering from Topeka who is organizing this year’s event. Joy isn’t just the organizer — he was a participant during his high school years. Aerospace engineering: Contestants will be asked to design and build a rubber-band-powered aircraft that can clear an 18-inch-tall obstacle. Chemical engineering: Students will try to design a “chariot” powered by a noncombustible reaction that travels at least 10 feet. 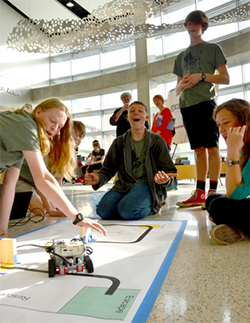 Mechanical engineering: Teams will design and program a Mindstorms robot to move through a themed obstacle course as efficiently and effectively as possible. Other categories include computer programming, bioengineering and civil engineering. Teams can have up to four students, and winning teams will be awarded $2,000 in scholarships to KU, to be split among the team members. Corporate sponsors include Kiewit, Textron Aviation and Burns & McDonnell. The free event is scheduled from 9 a.m. to 3 p.m. Oct. 24 at the engineering complex; a pizza lunch will be provided for participants and their teachers or sponsors.